Rather than the episodic structure and large cast of characters of the first installment, the second has a strong dramatic arc focusing on Elena and Lila and their families’ different responses to the girls' determination to continue their education. Lilia’s family adamantly refuses to consider it; Elena’s, albeit reluctantly, agrees. Elena’s family has more resources. Her father could consider the possibility of his daughter continuing her education in part because his family was not as economically burdened as Lila’s, whose large extended family was supported by her father’s work as a shoe repairman. 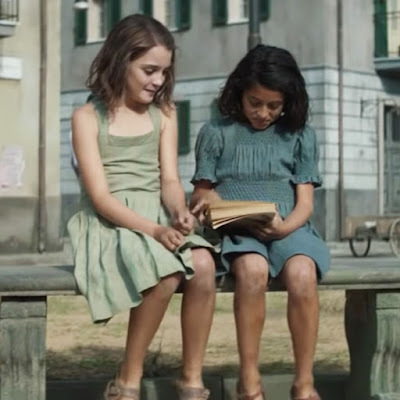 Ferrante signals this difference in the economic status of the two families in the description of the girls’ dolls in the opening pages of My Brilliant Friend, recreated in episode one of the HBO film. Elena recalled that her doll was beautiful and newer than Lila’s doll; hers had a plastic face and plastic hair and eyes and wore a blue dress that her mother “had made for her in a rare moment of happiness.” She recalled that Lila’s doll was dirty and ugly and had an old-fashioned cloth body filled with sawdust. The difference in resources between the two families was not great, but apparently just enough to foreclose the option of further schooling for Lila. I wonder how much of this I would have picked up from the film if I had not read the book. The second episode portrays what my friend Sue found missing in the first installment-- two spirited young girls, who find pleasure in each other’s company despite their bleak surroundings. The big surprise of the film was Maestro Oliviero who in the book sometimes verges close to caricature. The woman who plays her creates a complex, sometimes sympathetic character passionately devoted to those few students she believes have exceptional promise and no doubt doing incalculable damage to those she dismisses as dunces. She recognizes Lila’s genius and is devastated that Lila cannot continue her education. In the novel, Ferrante reminds us that what we are reading is filtered through the memory of a mature woman. Director Saverio Costanzo does something similar with voiceovers. However film doesn’t lend itself to these explicit reminders as easily as the novel and some reviewers have criticized Costanzo for excessive use of the voiceover. I actually think voiceovers should have been used more often, especially the scene where Elena tries to figure out Lila’s motivations in encouraging the trip to the sea and then insisting they turn back. In retrospect, Elena wondered if Lila, envious of Elena because her parents were allowing her to continue her education, had encouraged the trip, hoping that Elena’s parents would punish her by refusing to allow her to continue her schooling. Or perhaps, Lila had insisted they go back to avoid that very punishment. Years later, looking back at the incident, trying to disentangle Lila’s motives, Elena speculated that perhaps Lila had at different times wanted both outcomes. The episode foreshadows the trajectory of their relationship in which deep attachment coexists with envy and hostility. Anger, jealousy, these are emotions film can convey. Complex, contradictory thoughts, deeply felt but sometimes barely understood—this is the province of the novel. So far I consider the HBO series a successful adaptation, but it has not shaken my belief that great novelists, and I include Ferrante in this category, provide access to the interior life of fictional characters in a way film cannot. Ferrante’s Neapolitan Quartet reminds us of what only literature can do.